iPhone App - Precious Oil Ministries Inc.
BEAN is available in the App Store! 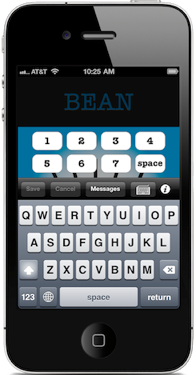 BEAN was designed to help those with TBI communicate with those around them. Designed to help communicate by selecting number sequences that correspond to the english alphabet. 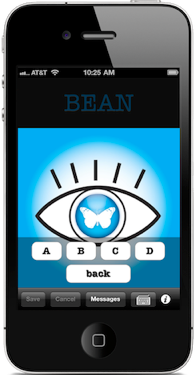 If the TBI patient can move just one body part or control eye movement this app can be used to help communicate. Designed by Mark Hurley and Chris Cleveland. Chris's sister Corinne Salcido developed this form of communication after suffering a severe stroke. Corinne recently passed away and this app will forever carry on her memory and be a testimony of her unending commitment to never give up in the face of the tough situations life can bring our way. Download a copy today. All proceed’s will go to aid in further development and implementation of this and other apps for TBI patients, family members, and friends.